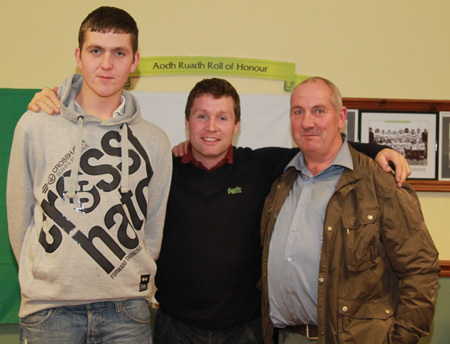 On Wednesday last Aodh Ruadh juvenile hurlers held their fifth annual presentation night in Aras Aoidh Ruaidh and, as in previous years, it was a great night for the big crowd who attended, both young and old. 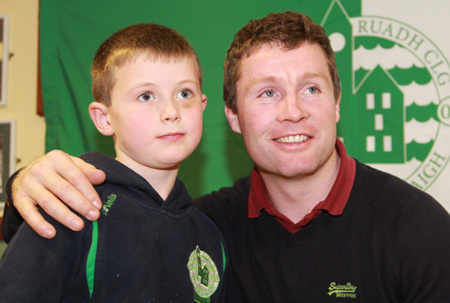 This year's special guest was one of the game's leading forwards Galway great and current All-Star Damien Hayes, he was accompanied on the night by one of the leading underage coaches in Galway, Francis Larkin. 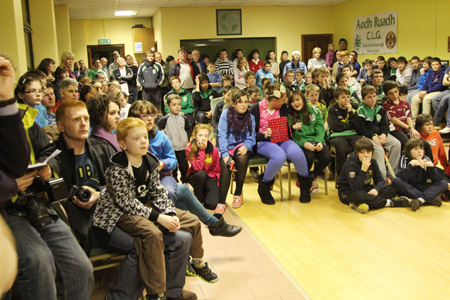 Juvenile Hurling Chairman John Rooney acted as master of ceremonies and he welcomed the large crowd to the event. 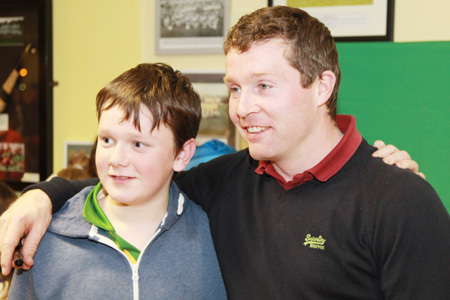 He pointed out that it was the fifth year of Juvenile Hurling Presentations and in line with previous years we were delighted to have one of the game's leading players over the last ten years attend this year's presentation night. 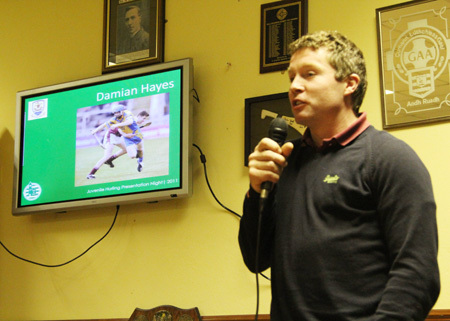 He gave a brief outline of Damien's career and achievements, the Portumna ace has won two All-Ireland minor medals, three All-Ireland club medals, three All-Stars, two National League medals and he was part of the Galway team that won a historic first Leinster title this year. 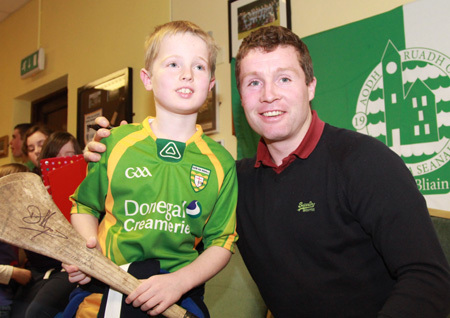 He thanked Damien for honouring a commitment he made to him earlier in the year to visit Aodh Ruadh, despite his hectic schedule, he had only returned from the All-Stars trip to New York on Sunday, and his upcoming wedding is on December 8th and work commitments Damien didn't let him down. 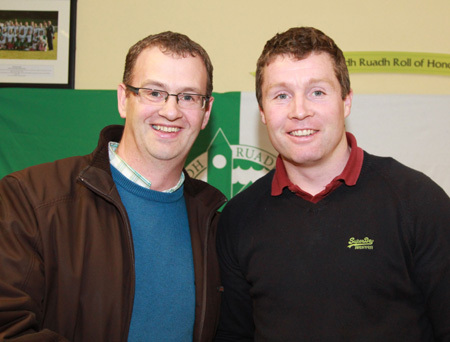 He also welcomed Francis Larkin to the event. 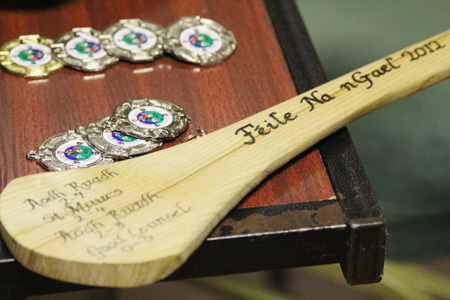 He explained that Francis was a top underage coach in Galway and is also a hurley maker along with his father Tom Joe Larkin and that their family are over 100 years in that business. John invited the crowd to loook at the images of Damien playing on the screen and thanked Brian Drummond and John Hughes for their work preparing this display. 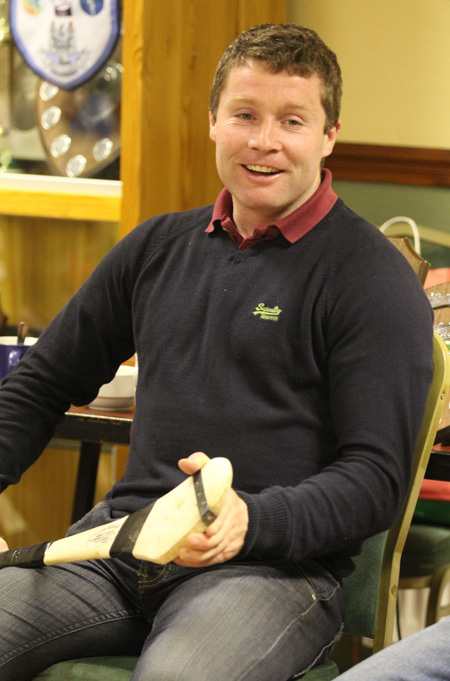 John said that 2012 was another great year for juvenile hurling in the club and he pointed out to the crowd trophies they won during the year. The under 12s won the Primary League Shield beating a strong Na Magha from Derry in the final. The under 16s won the Alan Ryan / Seamus Grimes tournament beating Ballycastle of Antrim in semi-final and Kevin Lynch's of Derry two of the top teams in Ulster. 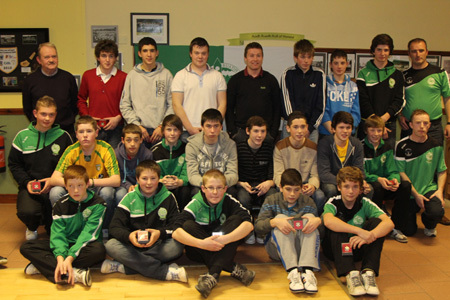 The under 16s also won the championship and the minors won the League. The presentations began then and John called on each manager to come forward and talk about their season and introduce their squads to the audience. 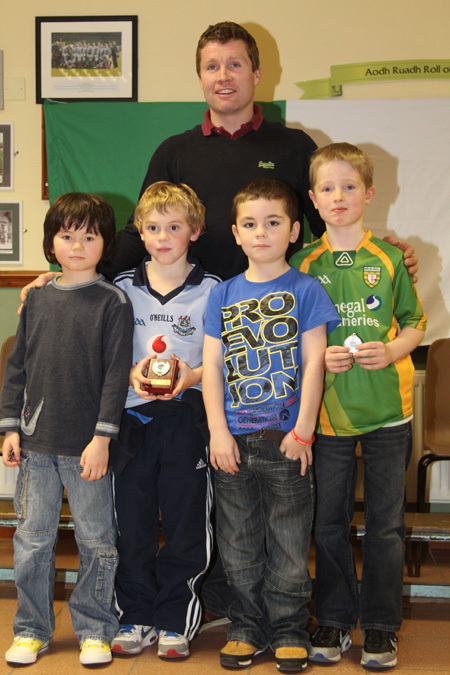 The first manager to address the large crowd was Pauric Keenaghan who along with Dennis Daly managed the under 8s this year. 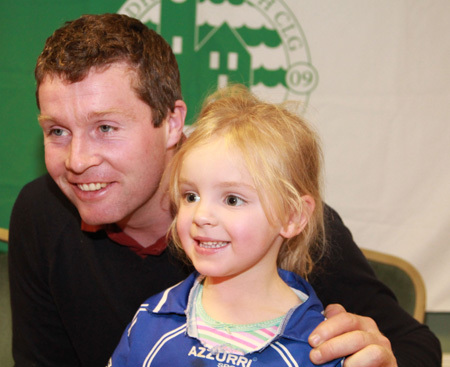 Pauric spoke of the blitzes the under 8s played in throughout Donegal and they also played in a number of Ulster blitzes in Dungiven, and played a number of challenge games against Manorhamilton and Saint Eunan's. 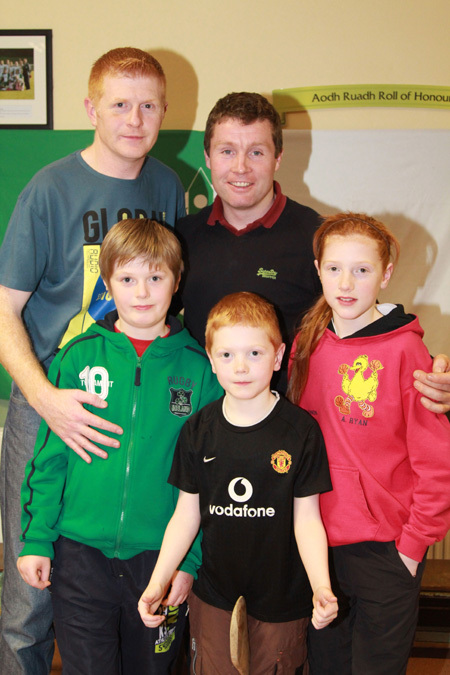 Overall they had a great season and were very enthusiastic to learn all the skills of the game. 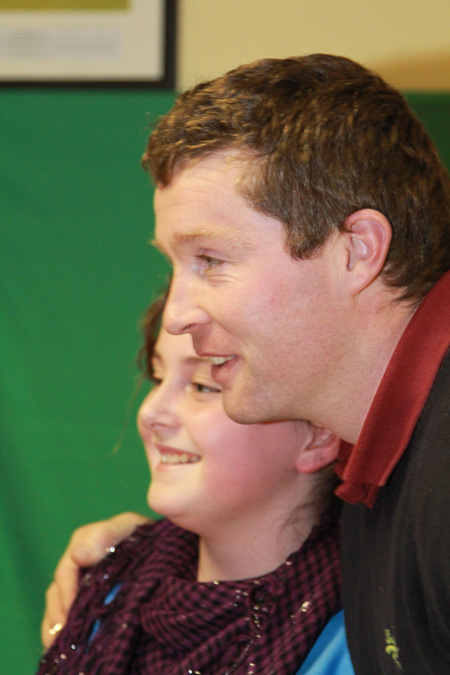 Pauric thanked all the parents who helped with transport throughout the year. He thanked the panel for their dedication throughout the year, he then called forward the panel to get their medals from Damien Hayes. 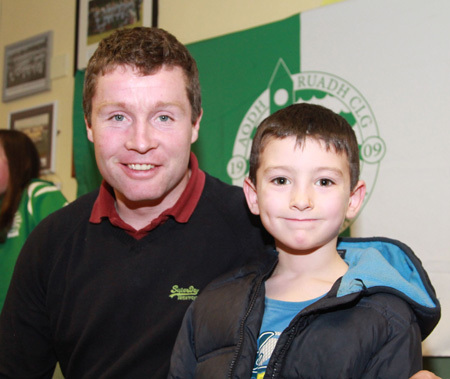 The next squad to be recognised were the under 10s managed by Eddie Lynch and Chris Kelly. 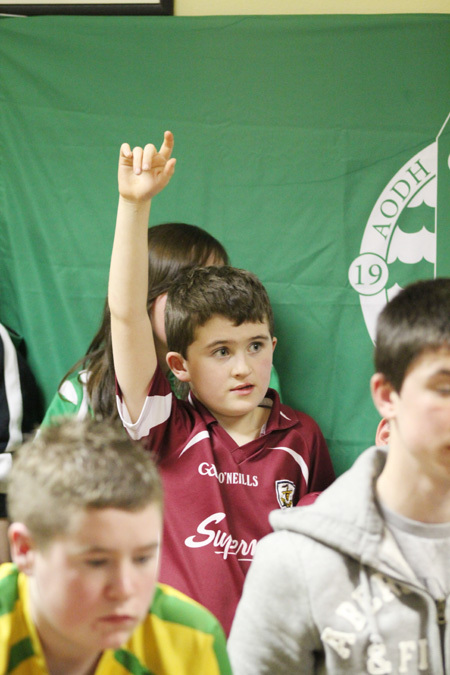 Eddie outlined to the crowd the great progress the under 10s had made throughout the year, they had won the majority of their games in the blitzes in Donegal. 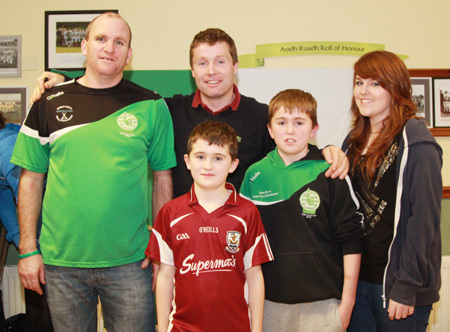 The under 10s had also taken part in the Ulster blitzes in Dungiven where they also performed brilliantly. Eddie thanked the entire panel for their dedication, Eddie also thanked the parents for all their support throughout the year with transport and catering. 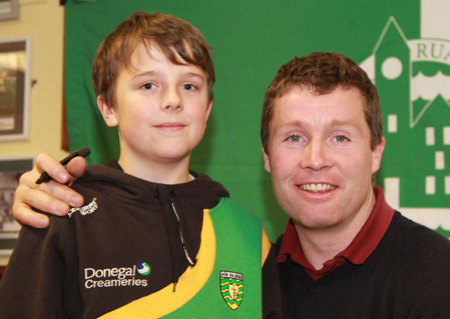 At this stage John called on the night's special guest to talk to the crowd, Damien Hayes thanked Aodh Ruadh for inviting him to their presentation he said he was delighted to come to Donegal and see such enthusiasm for hurling here. 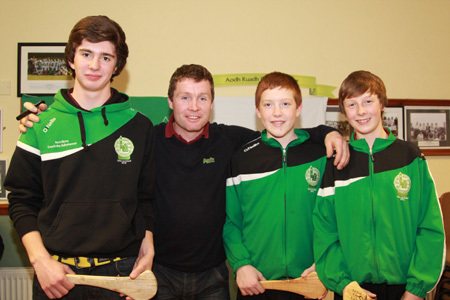 He encouraged all the lads to keep on hurling and congratulated them on their success in 2012 and wished them continued success in 2013. He said he looked forward to meeting them all later in the night and sharing his experiences with them. 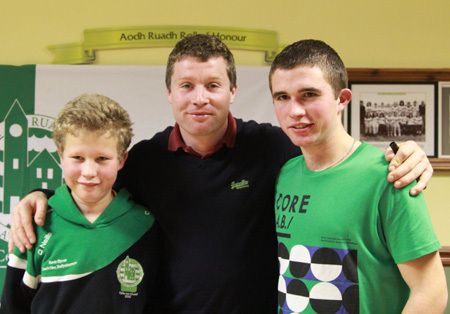 John Rooney under 14 manager was next to speak he thanked Mike Lynch and Peter Horan for all their help with this squad during the year. 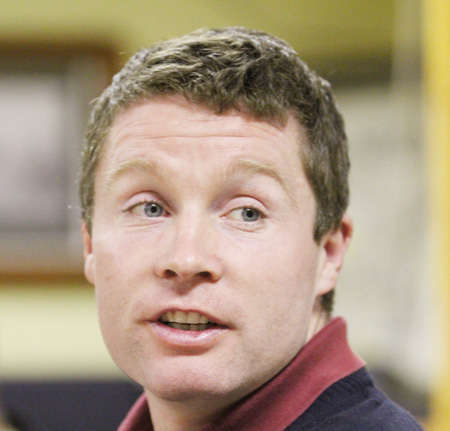 He said they started training in March with 17 players and they finished the season with the same 17 players, he thanked them for their great commitment and also thanked their parents for all their help bringing the lads to games and their support with all the fund-raising efforts for F�ile na nGael. 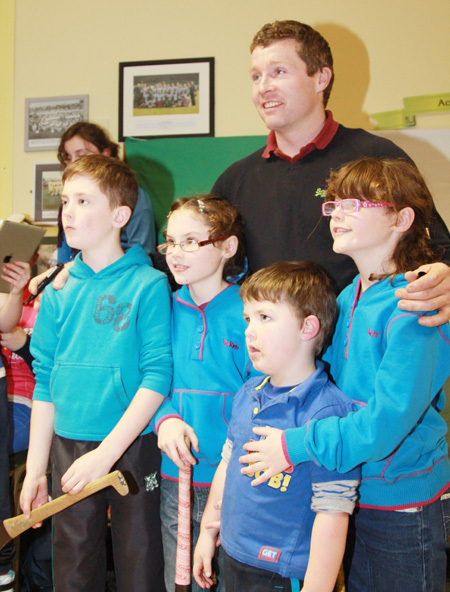 He spoke of how they qualified for the F�ile na nGael finals in Dublin. 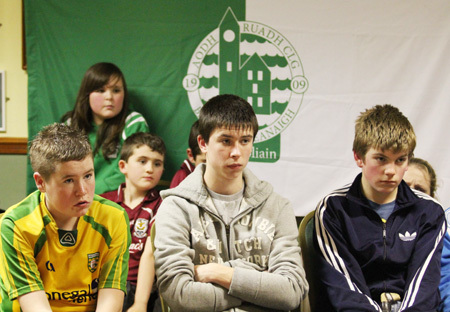 They had the smallest squad there with only 17 players yet the boys performed brilliantly and won their two games, he spoke of their disappointment at how they were treated by F�ile na nGael and thanked all the parents who travelled to Dubin and supported the management team during a very difficult period for them. He said he had no doubt the panel would come back even stronger as a result of their experience. 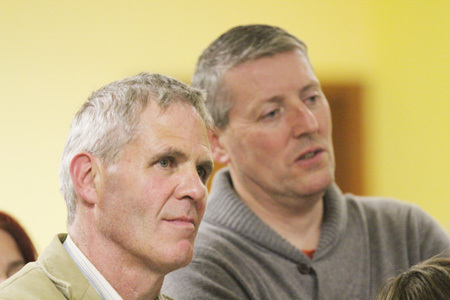 They also finished joint top of the league with Buncrana but lost out in the league semi-final, they were also beaten in the championship final. 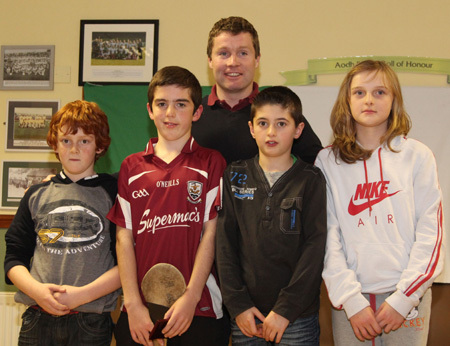 He thanked Maureen Keenaghan, Pauline Faherty and Tara Keenaghan for the lovely hurls which were being presented to the lads to recognise their brilliant performance in Dublin. 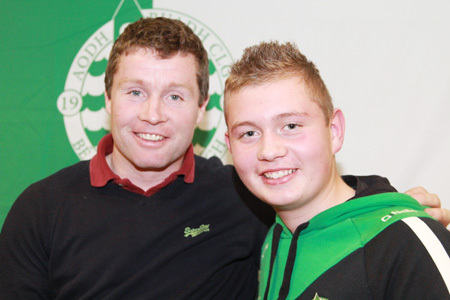 The same management team were in place for the under 16s. 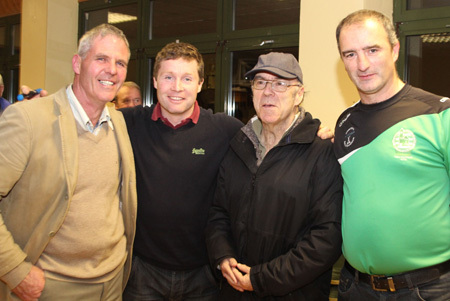 John thanked Peter and Mike again for all their help with this squad. Earlier in the year it looked as if there might be an under 16 team as a number of players didn't make themselves available. 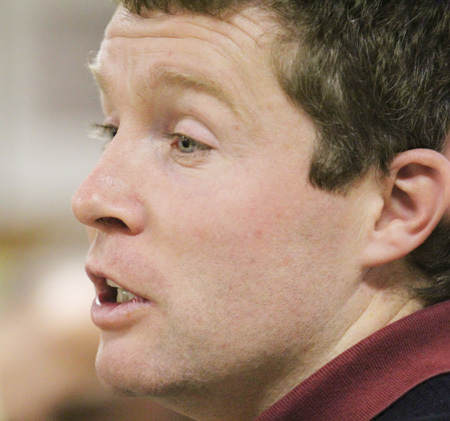 He thanked the squad for their great loyalty all year, he outlined how they had won the Alan Ryan/Seamus Grimes tournament, a tournament very close to the hearts of Aodh Ruadh, defeating two of the best teams in Ulster in the semi final (Ballycastle) and final (Kevin Lynches). An under strength team lost the league final to Buncrana, he praised the lads for coming from 9 points down in the championship final to earn a replay which they won against Buncrana. 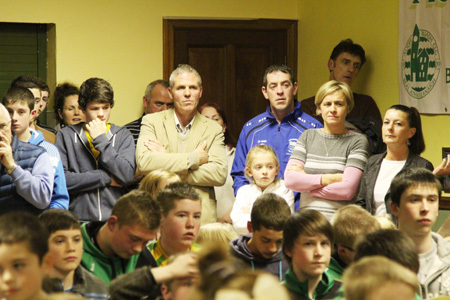 He thanked the players for their loyalty and all the parents for their support. 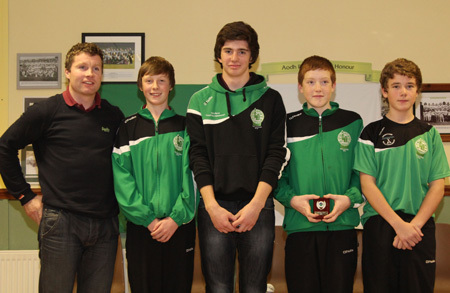 The last team to receive medals on the night were the minors who won the league. Aidan Begley joint manager with David Downey said the lads had a good league campaign culminating in victory, beating a highly fancied Setanta team in the final. Lack of commitment cost them success in the championship. He thanked the entire panel especially the younger players who put in a great effort. 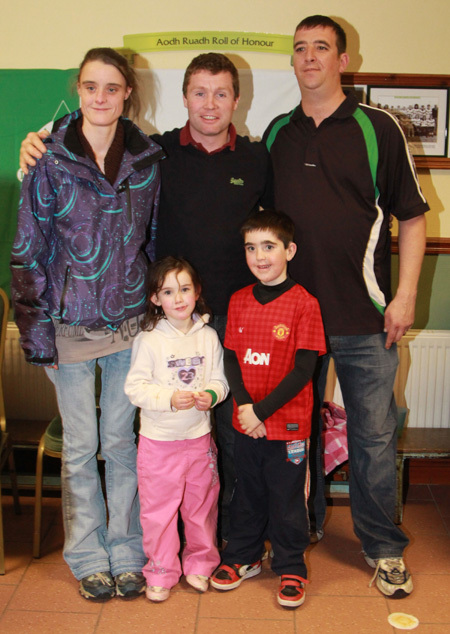 He thanked the parents who helped with transport. He said it was a very young panel and overall they had a very good year. At that stage it was time for some individual awards. 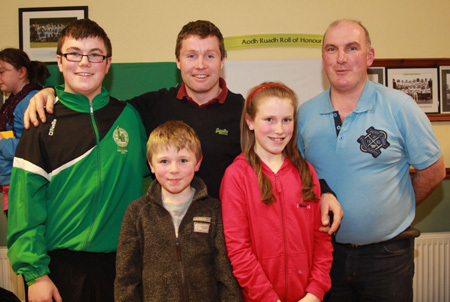 John spoke of how Aodh Ruadh players now featured on all county teams, from under 12 to minor. 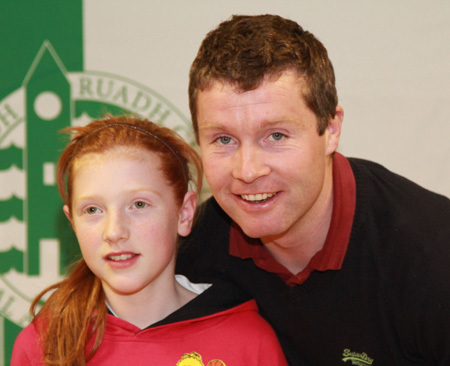 He spoke of how the county under 12s get to play in Croke Park annually. 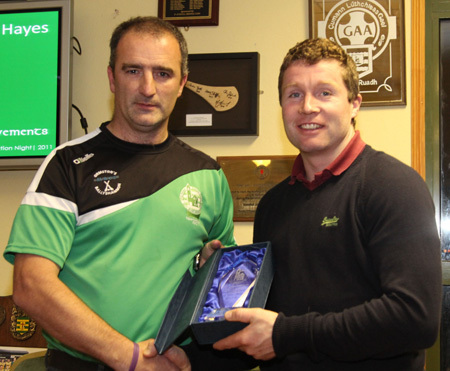 He called on Kevin McDermott to call our representatives forward to receive a plaque from Damien to mark their first of hopefully many appearances in Croke Park. 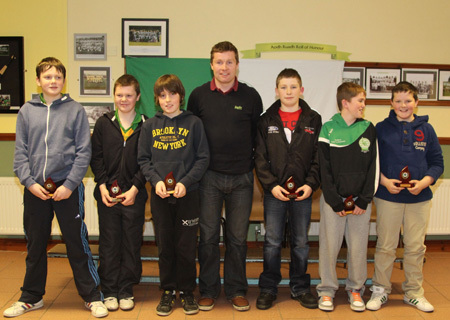 The under 12s who represented Aodh Ruadh in Croke Park this year were Pauric Keenaghan, Seosaimh McGee, Darren Sharpe, Aaron Peach, Odhran Kennedy and Evan McTernan. 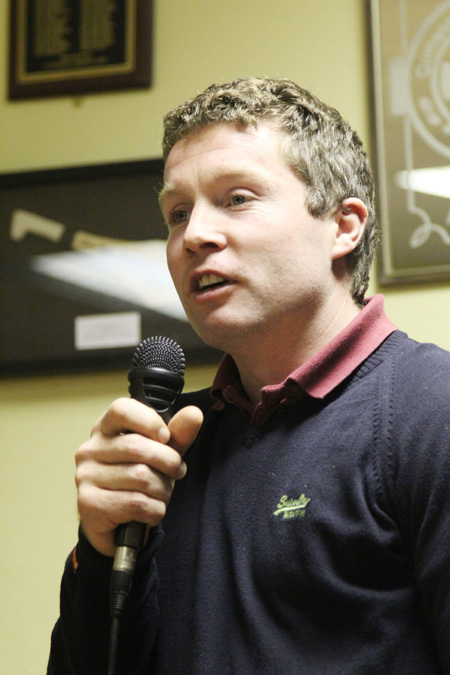 John outlined to the audience changes being made in Ulster underage hurling which will hopefully culminate in all-Ulster teams representing the Province in the future. 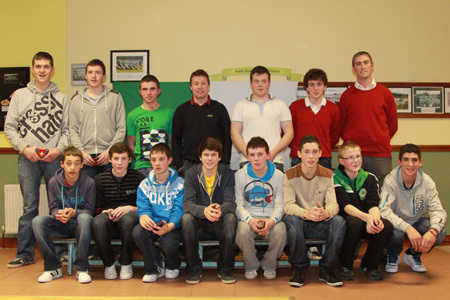 At present an under 16 squad is selected. 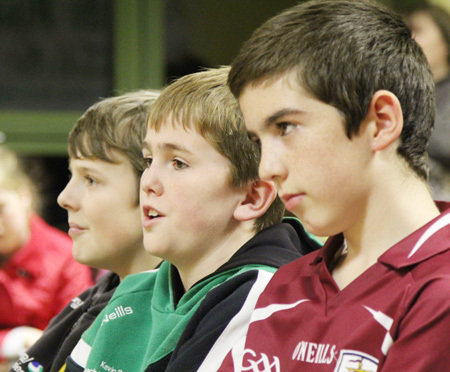 The panel attend a training camp in Jordanstown and play Connacht in two games. 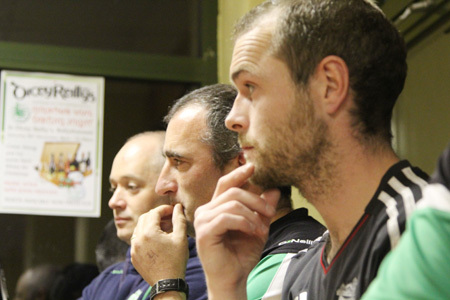 This year we had three players - Colm Kelly, Jamie Brennan and Eddie Lynch - on the Ulster panel. 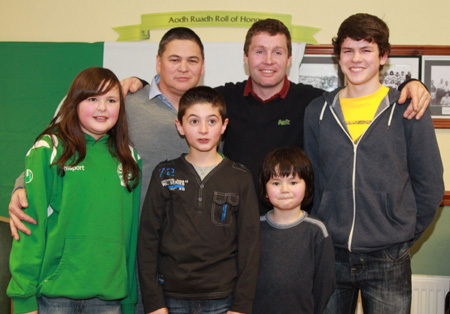 They beat Connacht in the two games. Also in Ulster at the moment there is an Ulster mentoring programme going on where the top 18 under 16 hurlers are being monitored for the next two years. 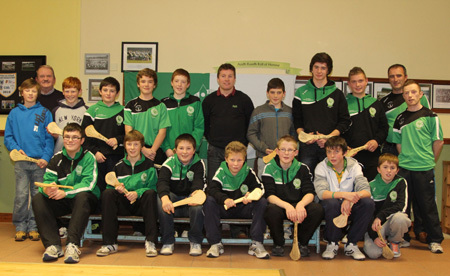 Colm Kelly and Jamie Brennan have made this squad. 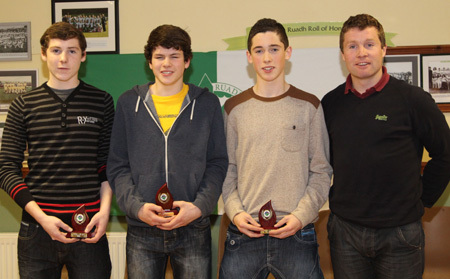 He called Aodh Ruadh's three inter-provincial players forward to receive their awards from Damien Hayes. 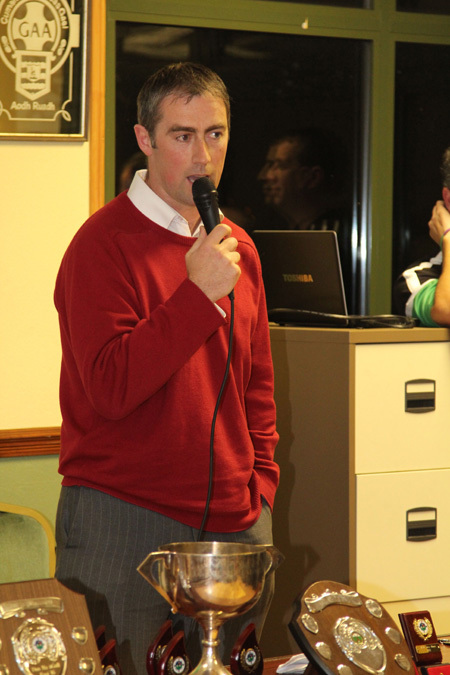 That brought an end to the presentations for the night, John thanked all who had made the night such a success, he invited all present to avail of the refreshments beautifully prepared as usual by the mothers of the hurlers. 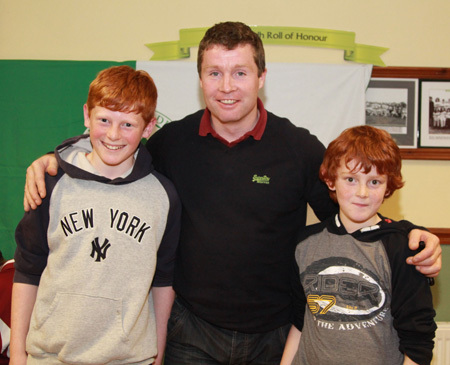 After all the grub we had the eagerly awaited question and answer session with Damien Hayes where our young hurlers got an insight to the life of top inter county hurler. He answered all questions with no different honesty to that demonstrates on the hurling field. Young and old took part in this session. 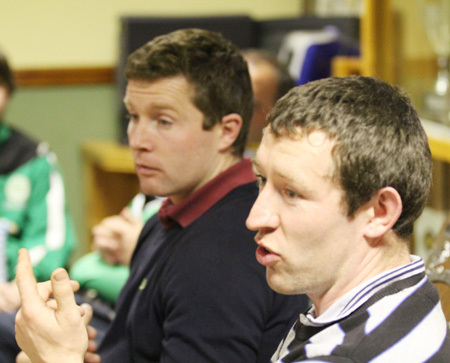 Francis Larkin also contributed greatly to this discussion as topics such as Galway's run to the All-Ireland, most difficult opponents, training regimes, favourite grounds, diet, Portumna's golden era, Aberdeen Angus cattle, farming, ash disease and marriage were discussed. 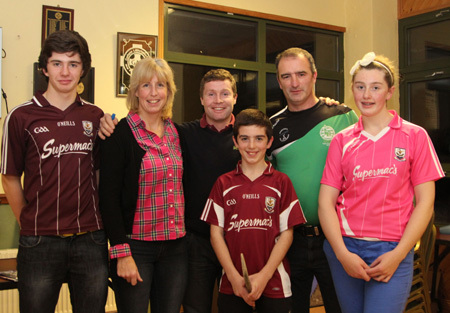 So came the end of the fifth Annual Juvenile Hurling Presentation night. 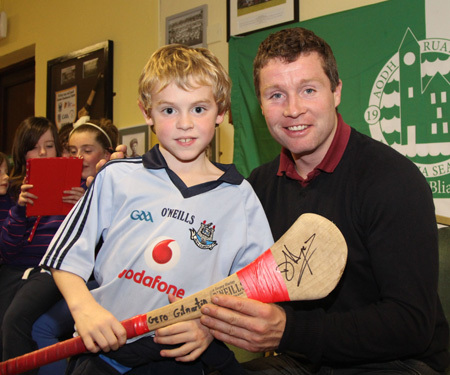 Damien showed himself to be a great ambassador for the game of hurling as he made time for a chat, autographs and a photo with everyone before the two lads headed off on their three hour journey back to east Galway.